Inspired by a true story, The Soul Retrieval is an award-winning suspenseful tale of love, loss and healing which follows traumatized southern beauty Henrietta Clayborn as she moves between her home in a small South Carolina town and the New Mexico Native American reservation whose spontaneous healings keep drawing her physician husband back. Tortured by her awful secrets, Henrietta struggles to thrive in either locale, but it is her unlikely friendship with Joe Loco––an eccentric Native American mystic with an Elvis fetish and a gift for healing––that shows her the way to be whole again. 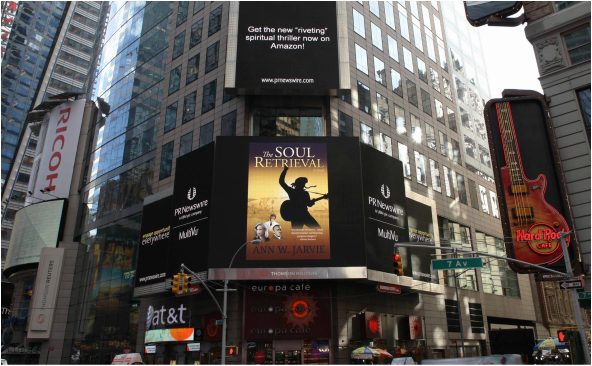 As seen in New York Times Square, The Soul Retrieval is the new "riveting" spiritual thriller now on sale! ON SALE now at Amazon and distributed through IngramSpark! "Riveting ... The Soul Retrieval takes readers on a journey filled with mystery, suspense, love and hope. It tells of two stories, one of the past and one of the present ... When the two stories collide, the reader is placed on a roller coaster of emotions." The official You Tube "Book Trailer" Video for The Soul Retrieval, on sale NOW on Amazon.com! Please like Ann W. Jarvie's Author Facebook page here for updates and special promotions!